Very good value and last a fair while. Create vivid lines and rich colour with our Colouring Pens Box of 100. 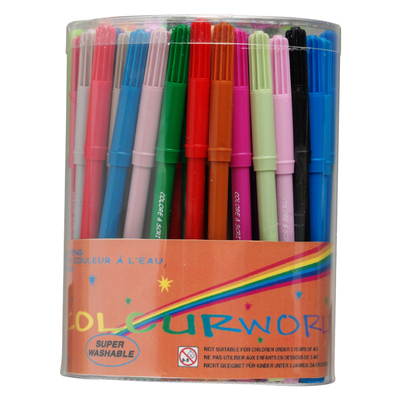 Designed to be suitable for smaller children as well as adults, these non-toxic pens have been finished with a fine tip for more precise drawing. This large pack size is the perfect choice for large and busy classrooms with a wide variety of colours for every single different project. Each pen comes packaged in a sturdy, plastic box that can be placed on any table for easy distribution around the classroom while also packing away compactly for suitable storage. Allow them to create those masterpieces that float around in their mind's with this practical and reliable resource. Here at Gompels, we also stock Colouring Fibre Tip Pens 20pk and our large Colouring Pencils Box of 288 so stock up on everything you'll need to create fun and exciting Arts and Crafts sessions.